[Videos and Links] Prepping for Academic Writing Month. It Starts Today! Academic Writing Month Is Here! For the past week or so I’ve been prepping to participate in AcWriMo, or Academic Writing Month. I revised my outline, gathered my materials, re-examined my writing process, and made some revisions. I’m using Write or Die to create writing challenges for myself, and I’m using James Hayton’s Three Month Thesis blog as my academic writing coach. Other writing helps include those found at Duke’s Writing Center web page: http://twp.duke.edu/writing-studio/resources/academic-writing/drafting. NOTE: The two links under “Paragraphs and Transitions” are particularly useful. Below are two videos documenting some of that process. The first video shares my streamlined computer folder/file structure. And the second video shares the amazingness of Citavi: How it can reside within MS Word to make citation and bibliography-building a cinch, and how it is best friends with Adobe and web browsers. This is especially useful with Google Scholar. NOTE: Mac users can run Citavi via Windows parallel. Enjoy the videos, and many vibes for your current endeavors! This entry was posted in academic workflow, Citavi, productivity, software product, video, writing by Z. Sanders. Bookmark the permalink. Have you stopped using Idea Mason? I notice Citavi’s come back into your workflow? If you did drop idea Masion, I’m interested to hear why. Thanks! Thanks for asking! I still use Idea Mason. But . . . only because in Idea Mason I can juxtapose my outline and notes right next to where I’m drafting. I never knew it before, but one of the reasons academic writing was so hard for me was because I was starting at a blank page to write. This even after having taken notes. But in Idea Mason, I can open up a writing container and configure it so that my outline and notes are to the right (in the area labeled “Comments”) and I’m drafting to the left. Very, very helpful. Sometimes I do a little practice draft of a sentence at the bottom in the area labeled “Footer.” Here is a picture to illustrate: https://theblossomingfledglingresearcher.files.wordpress.com/2013/11/ideamason_juxtaposeoutlinenotesanddraft.png. 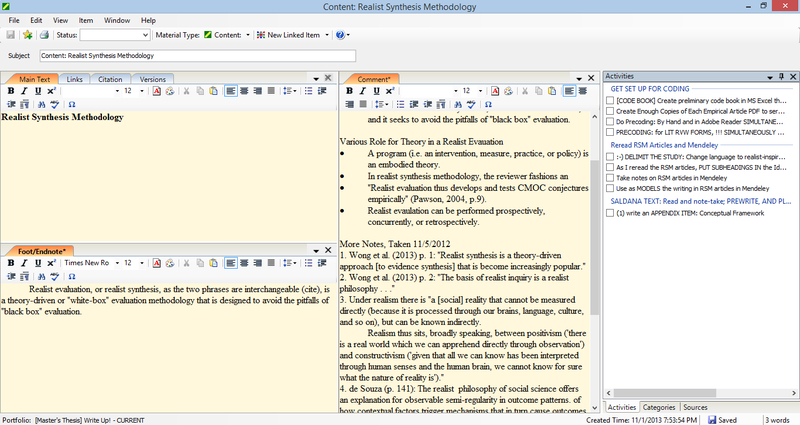 I found that the current way that Idea Mason supports building of the bibliography is a little time consuming. Also, copying back and forth between MS Word and Idea Mason was creating a lot of work: The long dash was getting rewritten as a short dash, and curly quotations were getting replaced with straight quotations. Finding and correcting all of that in an 80 page document gets really time-consuming. I have written the creators of Idea Mason about these. They are great about addressing issues, so we’ll see. In the meanwhile, I just get my ideas down in Idea Mason, and then copy to Citavi. I no longer export from Idea Mason, for the above-mentioned reasons. Please let me know if you have further questions. I’d be more than happy to share my thoughts.